Though baby acne might be distressing to the parents of a newborn child, it is important to remember that the vast majority of baby acne is entirely harmless. It is common in babies from birth through about seven months of age. 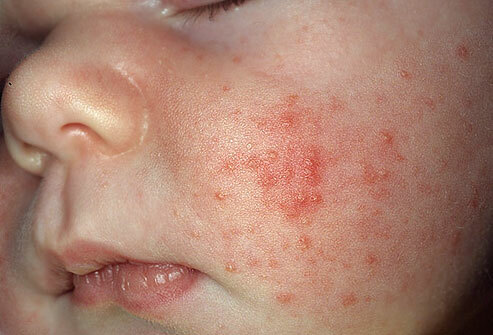 Baby acne is usually tiny reddish or white bumps. They might be present at birth, or they might appear within the first four weeks of life. It is much more common among boys than girls. Remember that it is usually harmless; however, parents who want to reduce the red, blotchy appearance of the baby’s skin might turn to a few gentle home remedies to help the acne go away sooner. Baby acne looks similar to teenage acne, only much smaller. The acne is made up of red or white bumps that rise from irritated skin. It is often on the cheeks, forehead and chin, though sometimes it might appear on the back. It could become worse if your baby is too hot, drools a lot or often spits up milk, or is in contact with fabrics that are a little rough, or those that have been washed in a harsh detergent. You might also see tiny white bumps on your baby’s face. These don’t appear to be the same as baby acne, and that’s because they aren’t – the tiny white bumps that you can barely see are called milia, and they are a very natural occurrence for babies. Those little bumps will disappear within a few weeks. Finally, a rash that looks more like scales than pimples, or a rash that appears on other parts of the baby’s body could be much more than baby acne. Sometimes this body rash can be cradle camp, eczema or other conditions that affect your baby’s skin. In most cases, baby acne is gone within a few weeks. However, it can sometimes linger for several months. If the acne is still there three months later or you are concerned because it seems to be getting more severe, speak to your baby’s doctor to make sure it is baby acne. If the acne continues, your doctor might prescribe a topical medication to help treat the problem. It’s good to note that if your baby has persistent acne, your child might deal with acne when he’s a teenager, too. There is no clear answer to that question, but there are a few theories. The hormones a mother passes on to her baby might lead to baby acne during the first few months. Other causes could be medications that baby is taking, or even medications the mother is taking that are then expressed in her breast milk. In some cases, skin care products have been known to cause baby acne, especially if they are not designed for babies. But just as with teenage acne, sometimes the cause can be elusive. Baby acne can be tough for a parent to see. You might be able to help get rid of it with the following gentle tips. Sometimes the soap you use on your baby’s skin can be the root of the problem. Make sure to use a non-drying soap, preferably one that is made with milk, as this is much gentler. Remember that sometimes soaps marketed for babies are actually harsher than what their delicate skin can handle; always look for the most natural, non-drying soap you can find. Always keep your baby’s face dry. That means having a cloth handy at all times to dry off his face when he drools or spits up milk. Avoiding moisture on the face can help avoid the clogged pores, which in turn helps avoid breakouts. Babies who have acne might actually make it worse by scratching at the area. To prevent this, put mittens on your child’s hands until the acne is gone. If the child pops open one of the pimples, it can lead to the spread of the acne. Baby powder can help dry the area it touches, which is why many parents try a little swipe of baby powder on the face when there is an acne problem. Just be sure not to use too much; you don’t want the baby to inhale the powder or get it into the eyes. If you are breastfeeding, remember that anything you put into your body eventually finds its way into your breast milk, which means that what you eat makes a huge difference. If your baby is getting acne, consider what in your diet might be causing it. For instance, many new mothers have found that fruits might cause a rash. Remember to be patient when it comes to baby acne. The problem is common, and can persist for several months before it goes away and your baby develops that beautiful, flawless face that every parent adores. The baby acne might bother you, but in most cases it doesn’t bother your baby at all, so keep that in mind when you are tempted to try one remedy after another. Just as with teenage acne, there are certain things to avoid when you are trying to clear things up. Don’t scrub, apply oily lotions or poke at the pimples. Never pop them, even if you are tempted to do so. Since a baby’s skin is much more sensitive than a teenager’s skin, avoid using any over the counter medications that are formulated for acne; this could lead to even more problems. Baby acne is almost always confined to the face and occasionally to the back. If your child has rashes or pimples elsewhere on the body, this is likely not baby acne, and should be evaluated by a physician. If your baby does have acne but it continues for three months or more, that’s also a time to consult the doctor and figure out what’s going on. Though medications are usually not necessary, there are some that can be prescribed if the acne becomes a severe problem.